Springbok divers Len De Beer, Ryan Burmester and underwater film maker Broderick Whittaker where traveling towards deep scotties when they noticed something large floating on the surface, as they approached it was identified to be a large brindle bass lying belly up. Ryan jumped in to investigate and found it to be alive but rather bloated but not to distressed, it couldn't of been there long as it was sure to be shark bait with all the toothy critters in the area. Ryan preceded to try and swim the giant fish down but with great difficulty, it was like trying to swim a tractor tire tube down, after endless attempts Brod the camera man gave him a hand and they finally managed to swim it to about 20 to 30 ft and with a few strong flicks of the fishes tail it made it to a depth were its buoyancy was compensated enough to be able to stay down and then with a couple more powerful flicks it swam of in to the gloom. Brod was able to get the whole event on film and the footage is awesome it will be shown on e-news soon.They are not sure what was wrong with the fish which was estimated to be between 150 to 180 kgs, they think that the brindle might have been feeding on sardines and had encountered a buoyancy problem because of getting to close to the surface in a feeding frenzy, they did not notice any fishing line or damage around the mouth and gills although there was some blood coming out of the gills which may have been caused buy over expansion. I finally have the Wahoo Winter Game Fish Spearfishing Comps results in, I suppose Chris west who organised the comp was seriously running around. On that note thanks to Chris and his team at Wahoo ..it is no small thing to run a comp of that magnitude ...well done and thank you. It was interesting to see that there were 134 entrants, some were not divers but when I looked it was only a hand full. 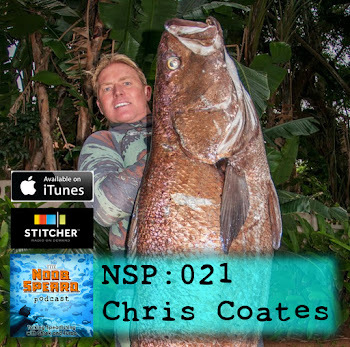 With over 100 divers it has to be one of the biggest spearfishing comps around, it is also in its 30th year ... so its probably one of the longest running, well at least in South Africa. Anyway the weather looked bleak for the weekend and there was allot of grumbling going on .... especially from me. I was down with the flue last week and was not even sure I was going to be able to dive. Anyway Comp morning came and the wind was howling, we got a late start ...probably because I was not firing on all cylinders. And we braved the strong north winds and headed 25km north to Leven Point. The water was green and gloomy and a bit on the cold side for up there. After 2 drifts we got onto the 25m line and started to see some fish. 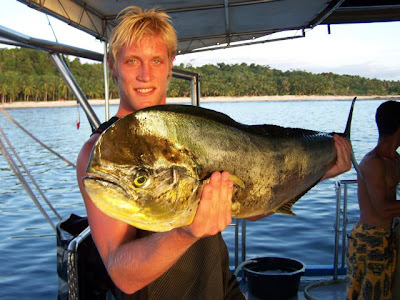 Morne was the first to see a fish, a cuta swimming just off the flashers. I watched him take chase and went down in the opposite direction hoping to see other fish once he had taken his shot. But the shot never came, and as I was about to come back up I saw a cuta on the fringe. I closed the gap and spinned the fish ... only to have the fish come off the spear!! Frustrated I hit the surface to find Morne equally perplexed, he was diving with a gun he does not always dive with and had left the safety on. So all he landed up doing was line up and pretend to shoot. Any way a short moment later "One Shot Scott" a.k.a Scott Rutherfoord .... swam down and blasted a small cuta ... we were all stoked some one had a fish .... you could have sworn he had just shot a Moose!! We had not finished the drift when on my way down a Wahoo of around 20kg swam underneath me. My gun was out and I could have blasted the fish behind the head, but fearing the fish would come off I waited for a body shot in the back half. The fish eye balled me and moved off a little, but still in range. I took the shot and hit the fish very far back ... it shot off like all Wahoo in a stream of bubbles and by the time I got to the buoy it had come off. You have no idea how many times I have replayed that in my head .... I should have ...could have ...would have.... but I did'nt!!! After hours of diving on different lines we headed out deep and tried a last ditch effort for a fish. We were in about 40m of water and a over sized Sandbar Shark (similar to a Zambi) was hanging around our flashes. I went down to have a look see, and with fatigue setting in I only dived to about 10m or so. Next thing I see this cuta swimming below me. I give chase and drill the fish properly, only to see a large Tiger Shark racing towards the fish. Needless to say I did not let the fish run and swam down the line to the spear and turned the fish. Round about then the need for air was very apparent and I turned for the surface with the fish kicking in the opposite direction beneath my fins. Looking back all I saw was a big Tiger Smile following me. Morne heard my shrieks and came flying past me towards the shark giving me enough time to secure the fish and put it on the boat. That was the last fish we saw for the day, and we headed back to the weigh in a bit bleak but with something to weigh. As it turned out every one else also battled and most guys chose to hunt snoek when they saw the water was green. So my cuta landed up being 3rd which was pretty cool. So all in all it was a good comp, the conditions were hard but i suppose thats the way it goes. Unfortunately for most guys they did not get any fish. And like my mate Morne said .."I just came to organise the trip" I guess that will go down as a down payment on a nice big Sailfish next time! Kelly Slater ....Babe Watch Shocker!! Kelly Slater along time ago in Babe Watch ...freak this is Funny! Just spoke to a mate down south and they had 400mm in 36 hours just a couple km in land from Port Edward. All the rivers are pumping properly and the sea is a total write off. This with the rough sea condition can be making the sea all that good to look at. 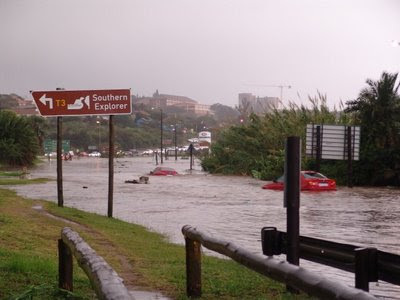 My mates comment was " Thats our diving over for a while"
Port Shepstone swimming ...sorry for those owners of those cars!! Back at home the rain was not that heavy, but the sea is also on its head. The swell is already dropping and by the weekend the sea will look better. 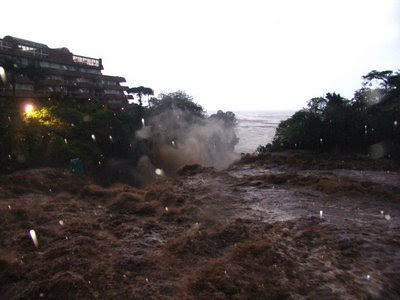 But I dont think there will be waves or a dive ....... good time to go to the Berg ..score points with the Mrs! This week end is the Wahoo Winter Game Fish and although the sea will have calmed down the wind will still be on it so it will be the brave that will be the only ones out there. If you have not seen the sea and were hoping to get a dive or surf in you might be a little disappointed. The sea has gone totally pear shaped, with a big bumpy east swell pounding the beach. I remember a couple years back getting a swell like this late in July, it messed the banks up so bad we hardly surfed until the following winter. That with our banks already being on the bad side could spell doom for the surf. Yesterday saw epic conditions, but no waves in Ballito. The mates hit Westbrook and had some humdingers, Steve Kunn was apparently getting pitted off his face ..... only like he can ... the boy knows how to ride a barrel. So I guess it will be a wait and see with the surf, it is supposed to peak at 4m later today, with a whole lot of north east winds as well. Sounds like a party!! The Wahoo Winter Game Fish is on this week end and I hope that it all settles down before then, otherwise it is going to be a seriously interesting weekend. On another note the Redman brothers Josh and Dan just got back from Indo on a surf trip .... I am not jealous ...promise! Their ol man sent me this pic of Josh with a quality Dorado he caught between surf seshes. It must be hard too have to surf epic waves and when you bored, bag one or two fish! Any way thats enough from me ...back to work! The Hibiscus Game Fish Open Spearfishing Competition was won by none other than Mr Scotty Rutherford!! This is the second Spearfishing Competition in a row that a Salt Rock Spearfishing Club member has got the biggest fish. Andy got that bus Wahoo at Spearfishing Nationals. This week end now is the Wahoo Winter Game Fish Spearfishing Competition and I am hoping the Salty's boys will represent well. The weather looks like we will have good diveable conditions on the weekend so bring it on!! 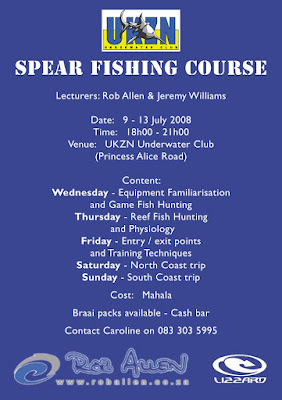 Guys there are a number of spearfishing comps running. This week end is the Hibiscus Game fish, next week is the Annual Wahoo Winter Game Fish, and some time in the next few weeks the Fishing Corner will be having their: Gummy Bait Sardine Machine Fishing Competition. The sea is looking good, I just hope that the east predicted for tonight does not blow!! Things are looking good, There is a real possibility of some good surf tomorrow. It will be on the small side but the conditions are looking good. The Dive will also be good and hopefully will hold out till Saturday. The Sards are down south with some guys getting some on the southern beaches. Lets hope they push up and bring some game fish with them. 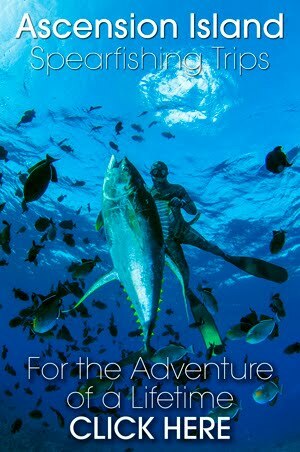 The Wahoo Winter Game Fish Spearfishing Competition is coming up in a week and a half. So far the weather has been good and the seas 100s. So with a little luck it will be a hum-dinger! This week end is the Hibiscus comp and that should be good, I know the guys will be hitting it hard to see if they can scoop the R4000. On the home front the swell is small and the vis looks ok. there is a small west coming and that will help keep it clean for the week end. But I am not sure there will be any surfing ... or great surfing going down. This is just a reminder about the annual Hibiscus Gamefish Open which is set for this weekend, on Saturday 14th June. This is going to be a excellent comp with all the good fish that have been about. I have heard reports of good catches of Wahoo, Sailfish and even some Kingfish and Cuta. The odd Garrick has also been sighted which bodes well for those that are doing a shore dive. A braai pack with salads, rolls, etc at the venue after the weigh-inn. A T-shirt with graphics designed by the legendary Darryl Hattingh. 1 free entry into the lucky draw. Epic Weekend in the Sea. If you were not around you missed out!! ..straight! Saterday has to go down as one of the nicest days of the year. The wind was almost zero the whole day the sea was clean and warm with a small clean swell running. I took my lighty Braiden for a dive in the morning on the high tide off one of the points. The dive was really great. We did not see any fish but the conditions just made it a really good dive. We then grabbed some pancakes before hitting the surf, it was perfect! Not to big for Braidy and big enough to get my old carcus moving. We surfed for about 2 hours went home and crashed. We woke up for lunch and went back down for another hour or so, and it was still going off. When I got home a mate Glen called up saying he had shot a nice Cuta and wanted to weight it on the club scale. He came round and we weighed the fish, it was 16'4kg ...not a bad fish in any ones book. The dive has been generally queit, but if you do get a cuta its generally a good fish. This fish was shot in only 8 meters of water near a drop off. There were apparently a couple fish in the shoal aswell. ...right place at the right time. Hopefully the wind holds off and we get some waves in the next day or so. I should be out Spearfishing!!!! & I dont feel like working!!! Anyway it looks like tomorrow will be good aswell so we will be out there 4sure. Tonight is Salty Club nite ...its just good ol braai social thing, so bring the family and friends ... nothing like a little bit of humor!! Sardine Run .. back on! After fears of the Sardine Run being a no show, the sards have been spotted on the Transkei coast. A couple of smaller shoals are cruzing with in 1km from shore with a larger shoal still far off. The guys in the 'know' are saying it still is not as big as it should be, i suppose only time will tell. If you have any news please send me a mail or comment below. Finally the forecasts are showing some winter type weather. There are some small south wests due over the next few days. They are not big but should clean up the water, not sure if we will get any waves tho. There are some good off shore winds due tomorrow ...pity the tides are high early!! Kelly Slater wins his 3rd Asp World Tour title for 2008 at Tavarua in Fiji. This will put him well in the lead and in a good spot to claim another world title. .....Kelly is a freak!! On the other hand I thought that I was surfing like Kelly ...probably more like Wilber and snapped my surfboard in a thick Sun Rise barrel ...damn!!! Tomorrow looks promising for those who can surf in the middle of the day as the high tide will put a damper on things first thing in the morning. Gee its about time .... we dot some waves. It was not epic because the banks were still all over the place after the 3weeks of east winds. Tomorrow looks promising if the east holds off, pleaz hold off! The forecast shows a nasty little east all night!!! that will be enough to screw everything up!! I have had a bunch of people commenting on the apparent Xenophobia attacks in Mozambique. And it seems like always things might have been blown out of proportion. Check out Mozambique Xenophobia on my blog if this interests you. Please feel free to comment on any posts especially if you can help bring clarity to the issues at hand.